What "Tale of the Golden Cockerel"
Human psychology is the only thing that hasn't evolved since ancient times. Therefore, a work written two centuries ago has not lost its relevance today. We are talking about the imperishable creation of Alexander Pushkin - "the Tale of Golden Cockerel". This latest fabulous work of the great Russian poet was written in 1834 and first published a year later. The plot of "the tale of Golden Cockerel" is developed around the main character – the king Dadon. In old age he wanted peace, and he received as a gift from an astrologer the Golden Cockerel, which is always warned in time about the attacks of the enemy. In return for such a delightful gift, the king promised the wise man everything he ever asked. The plot of "the Tale of the Golden Cockerel" was based on the novel of the famous American writer Washington Irving's "the Legend of the Arab astrologer". The Golden Cockerel had good service. Neighbors were afraid to attack the Imperial possessions. But one day he perked up and sent an army led by the eldest son of the king to the East. Eight days from it the troops were not missing, and then came the army of the youngest son. And after eight days Dadon the cries of the Golden Cockerel he moved with his army for sons. 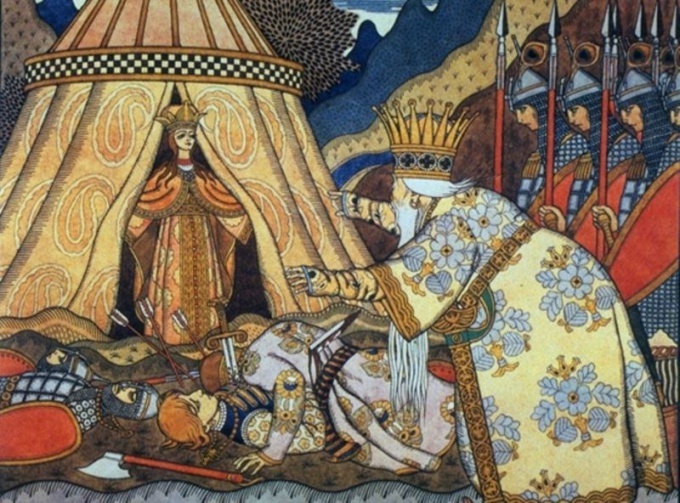 In the mountains he found a beautiful tent Shamahanskaya Queen and killed the sons, the swords plunged in each other. The king decided to marry the Queen Shamahanskaya, and here appeared a sage who wished to take it. The king turned him down and stabbed to death with a rod on his forehead. Then the Golden Cockerel pecked Dadon in the top of the head and the king fell dead. That is a summary of Pushkin's fairy tales. "The tale of the Golden Cockerel" perfectly illuminates all human vices. It teaches the reader not to want too much and says that sooner or later you need to pay. Not without a femme fatale. Shamahanskaya Queen is a vivid example explaining medieval gender genocide. One careless woman has caused him a large number of deaths. This work is comparable with folk tales, ironic tales and anecdotes on the dangers of female charms and beauty, which is scarier than any other enemy. Of the Golden Cockerel can only say one thing: it was not so much a harbinger of how the intermediary of trouble. Sage, which a "disservice" to the king, convinced that good good are looking for. Most importantly, what was not learned during his long life the Tsar Dadon – to prioritize, for which he suffered. Human actions, as human life, it is highly ambiguous and inconsistent. If Edward Murphy was alive, he would probably say the fact that imperfect system always fails. And this leads to disastrous consequences.